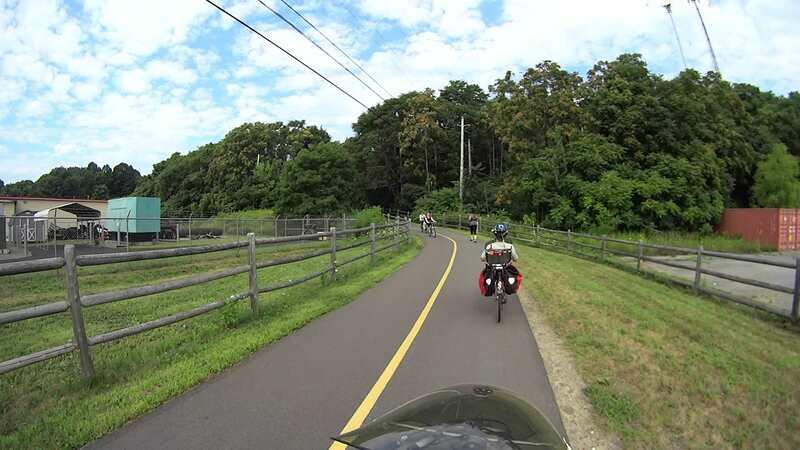 The Dutchess Rail Trail sits atop a pipeline carrying water from the treatment plant in the City of Poughkeepsie to the GlobalFoundries (neé IBM East Fishkill) complex. For good engineering reasons, the mid-line pumping station (equipment yard visible to our left) in Page Industrial Park sits directly athwart the pipe, which forced an abrupt S-curve on a relatively steep slope into the rail trail layout. 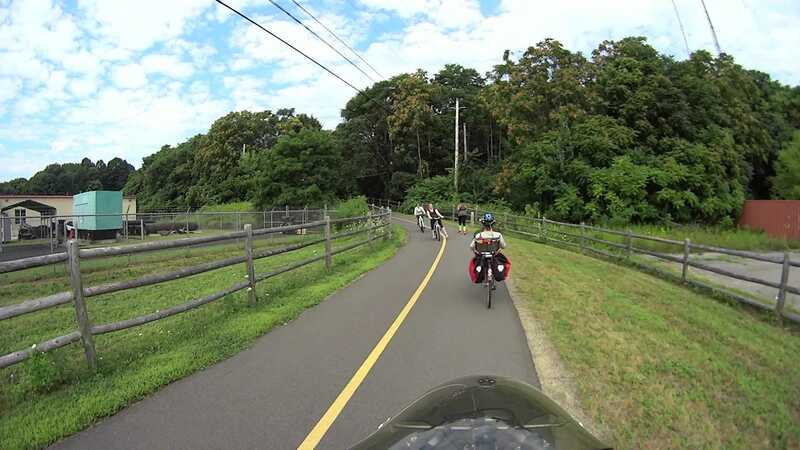 She ended up sprawled atop her bike, facing up the slope, with the front wheel just beside the rear wheel of my bike; her foot or some part of her bike whacked my left-side underseat bag in passing, but there was no bike-on-bike collision. No injuries for her, other than perhaps a bit of road rash, but only by sheer raw good fortune. 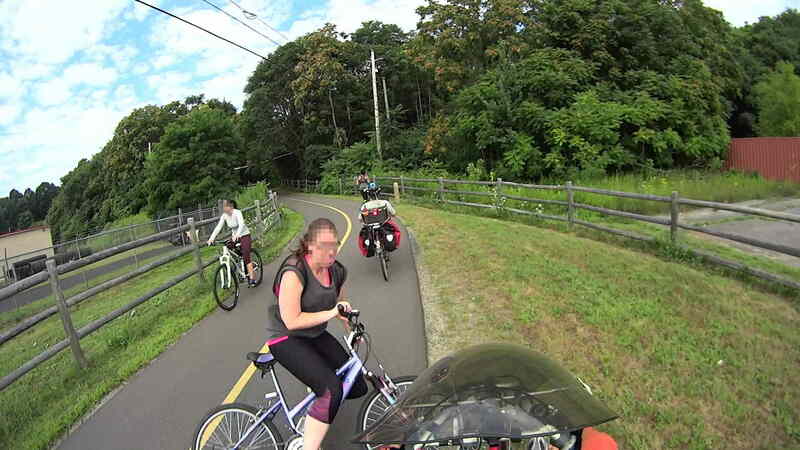 Reviewing the video shows she lost control at the transition from the trail to the downward S-curve, a few seconds before the first picture here and about five seconds before she stopped sliding past my bike, but the problem wasn’t obvious until the scene in the first picture. Mary never had a chance to react and, with less than two seconds until the not-quite-collision, my gross-motor reaction time just barely got me out of the way. Brake early and always wear a helmet. 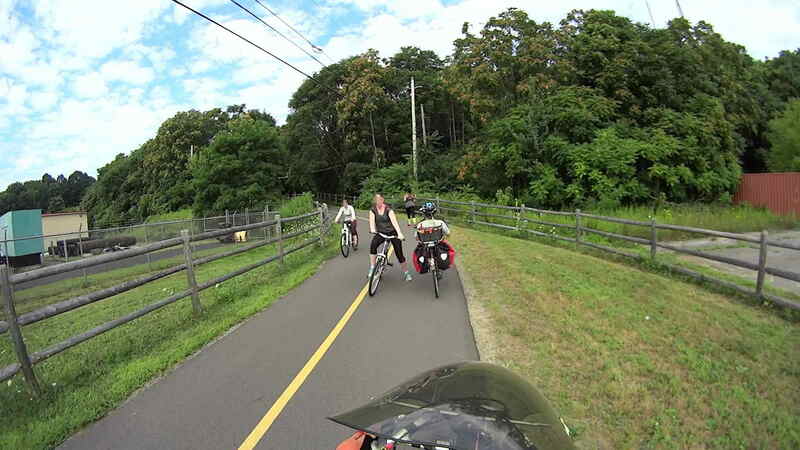 This entry was posted on 2015-08-23, 07:39 and is filed under Photography & Images, Recumbent Bicycling, Science. You can follow any responses to this entry through RSS 2.0. Both comments and pings are currently closed. Holy cow — what great reaction on your part, Ed. Mary must be living right, too. Glad no one was seriously hurt. Reminded me in a way of [Geraint Thomas on Stage 16 of this year’s Tour de France] (http://thebiglead.com/2015/07/20/geraint-thomas-crashed-head-first-into-a-telephone-pole-at-tour-de-france/), when another rider overcooked a corner and drove Thomas into a collision with a telephone pole. Thomas then calmly climbed out of the ditch, remounted, and went on to finish the stage. Chapeau, buddy. I give up — inserting inline links with Markdown is just beyond my capability, apparently. Arrgh. It actually worked better than you thought! Verily, there’s nothing like a good slug of adrenaline to perk up the next half-hour of pedaling. Whew!